A common problem for dual-boot Mac lab administrators is ensuring that all dual boot Macs are booted into Windows during a scheduled maintenance window. Dual-boot Macs may be booted into OS X and never receive the updates required to keep the Windows operating systems secure and in compliance with mandated security policies. Boot Runner helps solve this problem by ensuring that Boot Camp Windows systems are ready during scheduled maintenance windows. 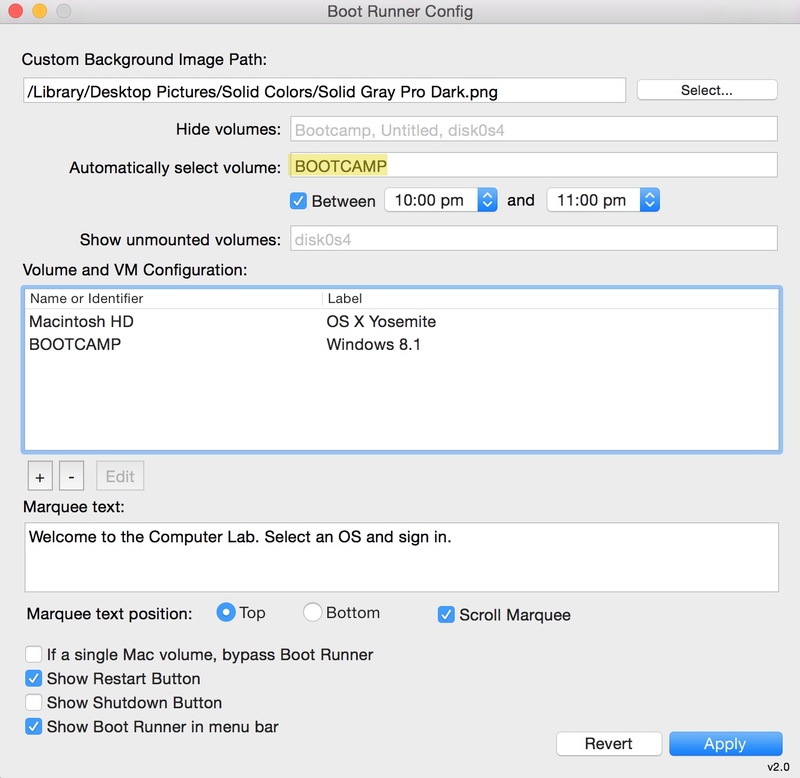 The Boot Runner Configuration app is located in the Utilities folder. Please see the Boot Runner 2 Admin Guide for an overview of Boot Runner features and settings. Specify the volume name or identifier in the Automatically Select Volume field. Examples will illustrate the most common configuration, scheduling start up of an alternate boot volume. 1. System Preference -> Startup Disk must be set to the OS X volume where Boot Runner is installed. A standard Boot Camp is usually installed on the fourth partition and named “BOOTCAMP”, but check each of your systems to ensure a correct volume name. Boot Runner accepts volume or BSD names, so “disk0s4” (for example) may also be used in the Automatically Select Volume field. Below Automatically Select Volume is a checkbox to specify the time period when the Mac boots into the specified volume. If this box is left unchecked, the Mac will always boot into the specified volume after each restart, which may not be what you want. The selection range for this setting is one hour up to 23 hours. Boot Runner is active when OS X is in a logged out state. If a user is logged in to OS X or booted into Windows, Boot Runner is not active. For time-based actions like the auto-select scheduler to work, it is recommended to implement a log out policy. This can be done manually in System Preferences-> Security & Privacy-> General-> Advanced -> “Log out after x minutes of activity” or by using configuration profiles to do the same. On the Windows side use Group Policy or set manually by creating a log out on idle time task, shut down and reboot back to the Boot Runner screen. “Log out when idle” scripts should be tested and fine tuned to ensure that unresponsive applications can be terminated gracefully and do not hang up the log out action. The ideal result is that regardless of state left by the last user, the Mac always returns at the Boot Runner selection screen, waiting on login, automation or remote management. Changes made to Boot Runner preferences take effect immediately, which is useful tool forremotely starting up Boot Camp outside of scheduled maintenance windows. Please see the Boot Runner 2 Admin Guide for a complete list of all available Boot Runner settings that can be managed with Configuration Profiles, Managed Preferences and “sudo defaults” commands.